PT Astra International Tbk - Toyota Sales Operation (TSO) or later known as AUTO2000 is a reputable automotive company in Indonesia with core business competencies in car retailer. AUTO2000 operates primarily as a main dealer of Toyota Automobile in Indonesia. AUTO2000 is one of corporate operation of PT Astra International Tbk (Astra Group), a leading business group in Indonesia with strong business focus on automotive Industry. AUTO2000 is an operational division of Astra Group serving as one of the dealers in charge of cars, spare parts and after sales service for Toyota. Originally registered as Astra Motor Sales in 1975. 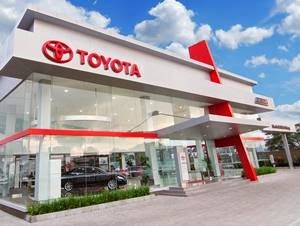 PT Astra International Tbk - Toyota Sales Operation officially established in 1989. AUTO2000 is renowned as the largest Toyota Dealer in Indonesia with maintains 40% market share of Toyota Automobile in Indonesia. According to information found in AUTO2000's website as cited by JobsCDC.com, AUTO2000 now supported by 123 authorized outlets spread in all over Indonesia. Bachelor/ Master Degree (S1/S2) in Marketing or any related field (E-Commerce/IT/Business,etc). Demonstrable experiences leading and managing SEO/SEM, marketing database, social media, and display advertising campaigns. Solid knowledge of website analytic tools (e.g Google Analytics, Netinsight, Omniture, Web Trends). Working knowledge of ad serving tools (e.g DART, Atlas). Up-to-date with the lastest trends and best practices in online marketing and. Bachelor Degree (S1) in Journalism or Mass Communication. Have a strong passion in writing and creating good content. Experience in creating content for a range digital platforms (e.g. blog, social media,marketing email). Familiar in handling social media platforms (twitter, facebook, Instagram). Good understanding about CMS (Content Management System) such as word press, etc. Having a good knowledge in Digital Marketing (Search Engine Optimization, Search Engine Marketing, Google and Social Media Ads). Have a good networking with digital agency and social influencer (added value). Good in attitude and able to work well in a team. Able to handle multiple project/task at once. JobsCDC.com now available on android device. Download now on Google Play here. Please be aware of recruitment fraud. The entire stage of this selection process is free of charge. Astra Toyota Sales Operation - Digital Marketing, Marketing Communication Auto2000 Astra Group April 2019 will never ask for fees or upfront payments for any purposes during the recruitment process such as transportation and accommodation.